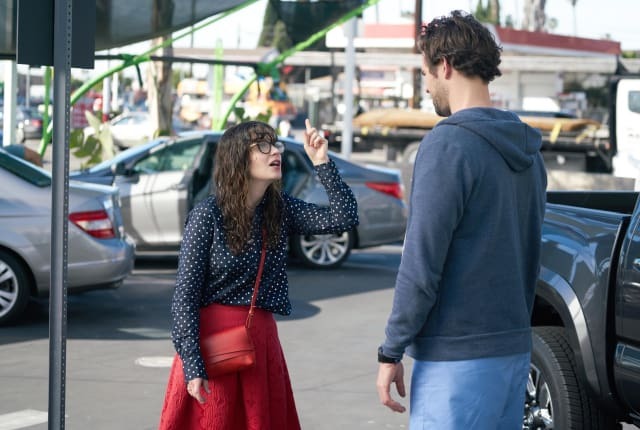 On New Girl Season 5 Episode 14, Jess gets served a restraining order by her former boyfriend and she needs Winston's help to clear her name. When you watch New Girl Season 5 Episode 14 online you'll realize how important it is to clear your name. Jess is shocked to learn Sam has taken out a restraining order on her and tries to get Winston to help her out. Winston informs her the only one who can get rid of a restraining order is the person who took out the order. Jess decides to go to Sam's work and leave a note on his car apologizing for being too clingy and tell him she's doing to back off. Unfortunately Sam starts to walk out before Jess can leave the note and she jumps into the back of a truck which turns out to belong to Sam. Jess quickly calls Winston for help, but her phone gets damaged when Sam goes through a car wash. Jess reveals herself to Sam and he gets angry with her, but feels bad when she doesn't have a way home and offers her a ride. On the way back to the loft Jess admits she can't stop thinking of Sam and that's why she keeps bothering him. Sam ends up confessing to her he has the same feelings. The two of them start making out and decide to get back together. Want to see what else happened? Go watch New Girl online now via TV Fanatic.